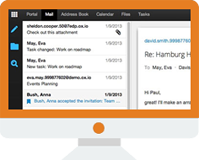 A robust business email solution designed for any business. NTSPL Hosting is a leading Enterprise Email Hosting provider in Bhubaneswar, India. 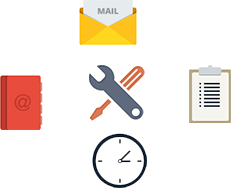 Our Enterprise Email Hosting is a perfect email hosting solution for all kind of businesses who need an enterprise standard email solution with all kind of features i.e. ; Calendaring, Address Book, Files & Tasks, Default Mobile Apps, Social Integration & etc. NTSPL Hosting’s Enterprise Email Hosting platform comes with the interactive Webmail interface, WebmailOX. Our Enterprise Email Hosting Webmail interface is completely responsive, so you can browse the Webmail from any of the mobile devices. Our Enterprise Email Hosting is deployed with NetApp’s FAS3240, industry grade server & built on robust network. Our Enterprise Email Hosting plan is the perfect email solution for the customer who wants a cost effective alternative to Microsoft Exchange & Google Apps Email. Our Enterprise Email Hosting platform is easily compatible with major email client; including Microsoft Outlook, Thunderbird, Mac Mail plus & etc. Let’s connect with your device's default app on Symbian, iPhone, Android or Windows, and you can get the privilege to access your collaborative business mailbox on the go.